Something that came up during the Saturday meeting, and it was really just a small hiccup in the speaker's presentation, was the issue of Voice. Not just the writer's voice, but the writer's voice in relation to the character's voice. Our characters are each unique in our heads, but when we're writing them, do they sound like us? Are they distinct in their mannerisms, thoughts, word usages, and point of views? The voice (or style) of our writing will come through, especially if it's strong, but we need to make sure it doesn't overshadow our characters. I really appreciated the conversation and everyones' input as this is something I've wondered about and hoped I didn't do. Have you encountered this in your manuscripts? Your voice superimposing itself onto the characters? What about books? Ever read one where everyone sounded the same? My biggest concern right now is what I learned at the meeting about conference apparel. Eek. I wore them often at my first conference. So now I have to buy some new shoes because all I own are flip-flops, nasty tennis shoes and open-toed heels. Business casual, that's how we're supposed to dress when we go to a conference. For me, it's helpful to remember what I wore when I worked at a bank. Slacks, nice capris, pretty shirts. If you've been to a conference, have you ever dressed too casual? Too fancy? What does business casual mean to you, and do you think it makes you look more professional? On Saturday I went to an American Christian Fiction Writers meeting in Orlando. There was just a few of us and it was wonderful. By the time it ended, I thought my brain would explode from all the awesome information. The funny thing is, I learned from both pubbed writers and unpubbed writers. I think there is a generosity in the writing world that's not seen in other businesses (there's also some craziness, but that's another post). I'm planning on sharing some of the goodies I picked up in some later posts. What do you think is the most important thing you've learned from a fellow writer? Have you experienced the generosity of a published writer before? From reading your blogs and comments, it seems most of you understand the importance of knowing your genre. But it's also important to choose the right "label". Suspense with romantic elements? Or romantic suspense? There are huge differences. I'm judging a contest right now. Have five entries, judged four. Of those four, only one really, really fits the genre. Two don't fit at all, at least not in the first forty pages. One somewhat fits, but the tone and setting is so different that it isn't quite what I expected. That's why we need to choose with care what our genre will be. We know there are reader expectations and I think if a book were marketed the wrong way, it could spell The End. What do you think? If a book is marketed in a genre in which it doesn't quite fit, do you think it will still be successful? And do you know for sure what genre your book is (I know most of you do)? I've been told writers should separate point of views by a space, a symbol or just a couple of clear sentences denoting the shift. Also, I've been informed that two point of views per chapter is more than enough. The rules are ingrained now. So... I read a current novel in which there were several POV characters. I didn't get lost. Each POV was appropriately marked. Then I picked up a romance author I haven't read in a long time, but she used to be my favorite when I was a teenager. There was head-hopping all over the place. I was so completely distracted but I persevered with the read because I hoped that, based on my past experiences with her stories, I'd glean some emotional satisfaction from her book. Guess which book made my eyes prick with tears? Boy, was I surprised. The head-hopping author. Somehow I managed to connect to the heroine of the story and when the black moment came, I felt it. I watched two movies recently. One featured an ambitious, cutthroat business woman. The other, a happy-go-lucky kind of liar. Both of these characters had flaws that propelled the story. I liked heroine A, but not heroine B. Why was heroine A more likable than heroine B? With heroine A, the watcher is shown almost right away a brief glimpse beneath her hardened shell. Brief, but it makes all the difference. Heroine B is presented as a "nice" person, but I don't think that made her likable. I think for her to have been more likable the watcher needed to see something early on that showed heroine B actually cared for people around her and just didn't use them for her own purposes all the time. My conclusion? A likable character may have horrible flaws, but they must also present some form of virtue, and right away, so that we, the reader, can see that this character has potential. And that they're worth rooting for. 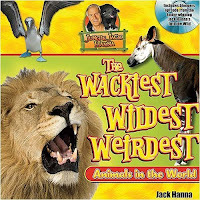 I recently received The Wackiest, Weirdest, Wildest Animals in the World by Jack Hanna in the mail. Thanks to Thomas Nelson's book review program, I get all sorts of cool stuff to read and review. The book is filled with all sorts of cool facts that even an adult might like to read. Big pictures and bubbles of information keep each page interesting and bright. The animal facts range from the ordinary to the really weird. For example, you've heard of a Wallaby? It's like a mini kangaroo. According to the book, a Wallaby can't hop backwards. Very interesting and doesn't make much sense, but there you have it. I sat down to read this book with my kids but soon realized that they're too young. My five year old enjoyed some of it, but mostly they looked at the pictures then jumped up to play. I do think this book would be ideal for someone in middle school or towards the end of elementary school. A curious child who enjoys reading would probably like this book a lot. The main thing about tightening, according to Rick Steele, Acquisitions Editor for AMG publishing, is clarity. When we tighten our story, we're not just trying to make the sentences shorter. You may recall commenter Anita claiming that her lushness is wordy. For the most part, I don't agree (sorry, dear friend). Her style of writing is lush, but the purpose of her sentences are clear. Each word adds to the story and to the sensory experience of the reader. Make the sentence clear, make the meaning clear. What I got from this CD is that the sentence length is not as important as sentence impact. When you revise and tighten, do you have a certain process, certain words/phrases you look for first? Or do you go sentence by sentence? And how do you feel about my opinion on this? Anything to add? Recently I won some stuff off of Jen's blog. One of my gifts was a CD of editor Rick Steele speaking on Writing Tight. He really delves into things that I'm going to mention later. He also had his class do a helpful exercise in eliminating wordiness. Jane most often likes to pluck her eyebrows in a haphazard fashion. Lapping at his water bowl, the dog fell to the ground in an exhausted heap. She was so happy when the the call came from an editor. Go ahead and be creative with these, or even leave your own examples of wordy writing. Can you usually see your wordiness? Or does it take the help of a crit partner? Rhonda McNight reposted one of my posts!!!! It's on Urban Christian Fiction. Thanks Rhonda! I went to my first and only conference in 2007. While there, I heard a lot about sending thank you cards. Thank you cards? My mind stuttered over that idea. The only time I sent those were after baby showers and my wedding. I left the conference and didn't send a thank you card to the kind authors who critiqued my sample pages or to the agent who gave me sound advice. But the seeds had been sown. After I got my first contest results back, those seeds sprouted up and I sent thank you cards. Now I send them all the time. To the editor who rejected me, to the judges of contests, and to the bloggers from whom I win books. I would never have even thought of sending a thank you note if someone hadn't told me I should. Not that I wasn't thankful, I just didn't realize I should show it. Do you send thank you cards? Who to? The other day I watched my children as I folded clothes. They were playing on the back porch when my three year old sprayed some water against the patio concrete. Five year old Matthew studied the mark and then announced, rather gleefully, that it was a rocket ship. He instructed his brothers to come look and I watched out the window with a smile on my face. To Matthew, a water stain became a roaring rocket ship. It reminded me of a few weeks ago when I was driving and spotted a man in a parking lot hoisting a dead body into the trunk of his car. No kidding, (well, actually I am kidding... but for a moment it seemed real). Like Matthew, I see stuff. Do you? I just saw the movie The Proposal and I really loved it. There were a few shocking scenes but otherwise I was laughing throughout the entire movie. And feeling teary during some parts too. In so many ways, this movie was formulaic. It stuck to the romance formula with some wonderfully spunky dialogue. There were several plot points that I could identify and I could even wedge the characters into their "types". Yet, I really, really enjoyed the movie. In a romance, the reader has to wonder how the two main characters will ever overcome their issues and hook up. This movie epitomized tension. I KNEW they would end up together, but the beginning conflicts were so strong I didn't know how. Do you write "formulaic"? Is it a box to you, or a safety net? It's basically when everything you think you know, changes. The transformation is usually brought about by specific agents of change (got that term from the article it's linked to; worth reading). A friend recently told me she didn't think I was an introvert. That was my agent of change. Me? Not an introvert? I've lived with this image of myself from high school and until my friend said something, I didn't realize how I've changed. I'm still quiet. I'm still somewhat a loner who gets exhausted after any social event. But I also like to get out and laugh loud. Her comment completely transformed the way I view myself. It surprised me. In writing, our main characters need to have a paradigm shift. Either at the beginning of the story, in which the character's new view leads to the story taking its path, or at the end, in which the character's shift resolves the story. I love saying it, knowing I have it in so many different ways. And I'm so thankful I live in America. The government won't shut down my internet if I say my opinion. They can't throw me in jail for writing a book about Jesus. We can write the stories we want! I bet there's countries where the citizens can't do that. They can't even say what they think without fear of government reprisal. Can't choose their religion, the size of their family or the job they work. Hopefully I get to see some fireworks today, a reminder of the war fought for this independence. This lovely freedom to choose, a freedom that God gave all of us. I like the fourth of July. I hope you all have a wonderful weekend! Remember back in the day when you longed for a man, that one special man, who would fill your nights with warmth and smother you with spine-melting kisses? Remember how you'd see all the married couples and think "Where's my love?" And you'd look around and realize you were the only single person in the crowd. The loneliness got to you, drove you into the bookstore where, foggy-eyed and grief-stricken, you stumbled across a book titled (I'm guessing here) BEING HAPPY WHILE SINGLE. You bought it because it seemed like a good idea at the time. And then suddenly it seems all people want to talk about is how good it is to be single! The wives tell you to be relieved that you can stay up until three in the morning with the lights on. Be glad no one pees on your toilet rim.